Lead one of the seven great cities of the Ancient world. Exploit the natural resources of your lands, take part in the eternal march of progress, develop your commercial relationships and assert your military might. Leave your mark in the history of civilization by building an architectural marvel that will transcend the ages to come. 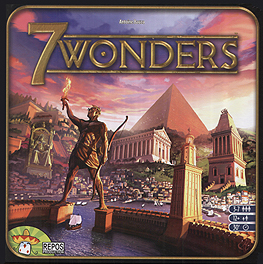 7 Wonders is a strategy game for 3 to 7 player, with an expert variant for 2 players included. I first played this game about 2 years ago and wasn't too keen on it as I didn't think the group I played with taught the rules very well so I was confused on what I was actually doing. When I played it at the autumn beer and pretzels tournament I really enjoyed it. Its best to play it with five or more players. The artwork is great and I like the fact you can buy an alternative art pack for this game. A great game but does need patience to teach this to new players. I'm looking forward to play it with some of the expansions. I played this for only the second time at the Autumn Beer and Pretzels event (Oct '15) and I have to say I thoroughly enjoyed it this time around! The first time I played I got a bit lost with the icons and what I was supposed to be doing, but this time I faired a lot better and had a blast! Here is my mini review: Components/Artwork: Gorgeous - I really like the art on this game, I love the player boards and the cards, they are bold and vivid and you get that feeling of ancient civilisations which I really like. The player boards and cards all seem good quality. Gameplay: Fast, simple (once you have played a couple of times) and above all, FUN! This is card drafting, so picking a card from a group of 7 and passing them to the left. The player to the immediate right and left of you then hold tremendous strategic importance, as they are passing you cards, and receiving cards from you in turn. You are looking for cards that help you build victory points in many different ways, giving multiple paths to victory. You could concentrate on science, or military power, or building your wonder, or improving your trading power. At the end of the game points are tallied up, I played with 7 people and the game took around 45 mins, which is great for a larger group game. Overall thoughts: I love it but I do think the game needs to be taught well, with much patience and you probably need a couple of games to get the hang of the cards and what they enable you to do. 7 Wonders is not a complex game, but there is tremendous depth and strategy to it! The days following I've been thinking about my strategy and what I would do differently, which is always the mark of a great game in my book. Well worth a place in anyone's collection. This is essentially a drafting game but whilst you are playing against the group as a whole to win you are directing competing against your neighbours as they can aid/hinder your progress by their choices. Each era you are handed a number of cards from which you chose a card to put into play or use to build a section of your wonder. In order to play a card (or build a section of wonder) you need to have access to the relevant resources required. These can be from those in front of you (Each player starts with one) or from one of your neighbours but if you use these you have to pay 2 coin to them. The rest of your cards you pass to the left/right depending on the current era. The selected cards are revealed simultaneously, this continues until you get down to the final 2 cards where you play one and discard the other. When this section is complete warfare is completed, during this players work out if they have defeated or been defeated by their neighbours military strength, for every loss you take a -1 VP for each victory you take a 1/3/5 VP (Era 1/II/II). Play continues in this manner for the other two ages at the end you total your scores, applying any bonuses from cards. This is a card drafting game about the building of the 7 ancient wonders and really does play in less than an hour. There are 3 eras in the game and each era has its own set of cards which are dealt out to the players so each player has 7 cards. From these, each player selects a card and then passes the rest of the cards to their neighbour. Then the cards chosen are revealed at the same time and built using the resources available to them, or bought from either of their neighbouring players. The cards come in different types, such as blue cards that give VPs, brown cards that give resources, red cards that give military strength and yellow commercial cards that sometimes give a discount when buying resources. There are some icons to learn, but these are quite intuitive and easily learnt. Across the 3 eras you gradually build up your tableau and then at the end of the game each colour of card is scored and the player with most VPs wins. 7 Wonders makes excellent use of the drafting technique, is easily learnt and fun to play giving you some hard decisions to make with each passing hand in deciding in which way you want to develop your tableau to complete your wonder.